Experience Creativity with comics’ greatest creators at the Image Expo Welcome Party sponsored by Image Comics and iFanboy to benefit the Comic Book Legal Defense Fund! The party is free for CBLDF members and kicks off at 8 PM on February 24, 2012 at The Uptown in Oakland, California. This party jump starts a weekend of celebrating independent comics and free speech at the Image Expo, taking place at the Oakland Convention Center. Proceeds from the Image Expo Welcome Party will benefit the Comic Book Legal Defense Fund, who will have a gift bag for members and donors! 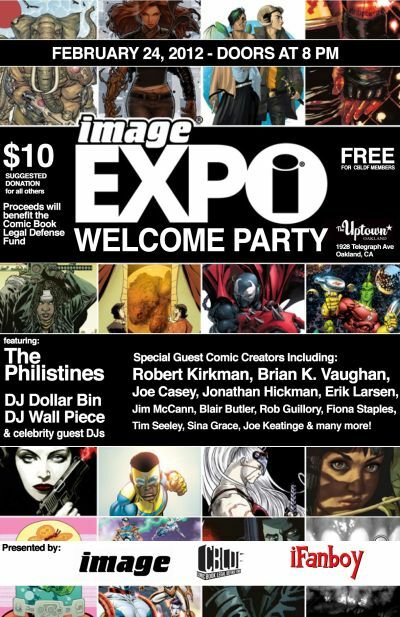 Many of the superstar creators appearing at the Image Expo will be in attendance for the Image Expo Party, including: Robert Kirkman, Brian K. Vaughan, Joe Casey, Jonathan Hickman, Erik Larsen, Jim McCann, Blair Butler, Rob Guillory, Fiona Staples, Tim Seeley, Sina Grace, and Joe Keatinge. The party will also which will feature a musical performance by The Philistines, as well as music from DJs Dollar Bin and Wall Piece and some special celebrity guest DJs.